As you know from many earlier posts, I am out numbered here on Glen Road by Brooklyn-born Italians. There’s nothing wrong with that especially given my love of Italian food. Most of the Italian cravings are taken care of by cooking from the Notorious B. I. G. (Brooklyn Italian Grandmother). However, every so often, I am asked to cook something that the troops used to get in Brooklyn. A good example came when I was asked if I could make “franks on club” meaning you take a hot dog and grill it, then you slice it length wise and serve it on a club roll. This was served up in a favorite Brooklyn diner and, just so you know, I have yet to attempt this culinary delight. Another recent request that I did sign up for was to make a cheesecake. 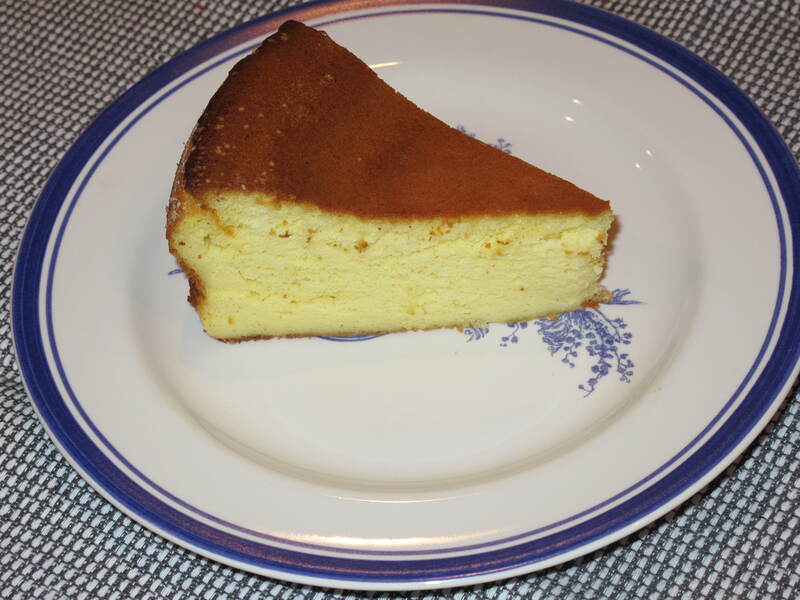 Not regular cheesecake made with cream cheese, but Italian style, using fresh ricotta cheese. 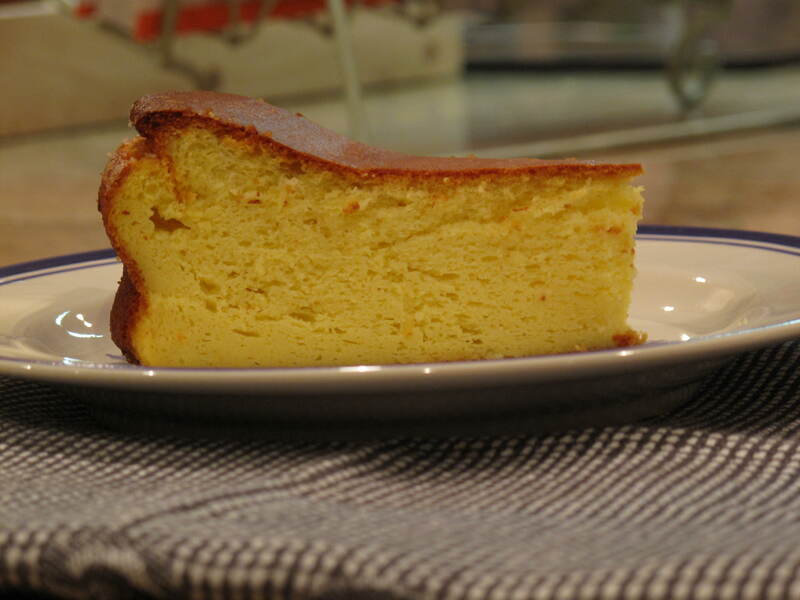 To be honest, I have made the ricotta cheesecake twice before the most recent request and, although it tasted good, it was not a pretty cheesecake because it had cracks on the top. So this time I signed up to make another one and decided to try to find a way to prevent the severe cracked top that I had experienced with cheesecakes from my past. There are a lot of ways via the internet to prevent cracking. From one post that said to spackle up the cracks with some softened ricotta to another post that said to take the cheesecake out of the oven every five minutes and vigorously shake it back and forth. Honestly, I’m not buying these two solutions. The one I eventually decided to try (with success!) was one that explained that cheesecake is made with lots of eggs. In the cooking process, these eggs actually expand which is why the cake rises. However, when taken out of the oven to a much cooler temperature, the eggs constrict so rapidly that the cheesecake cracks. The trick to a smooth-topped cheesecake is to cool the cake off in a much slower fashion so that the eggs don’t constrict too quickly and cause cracking. 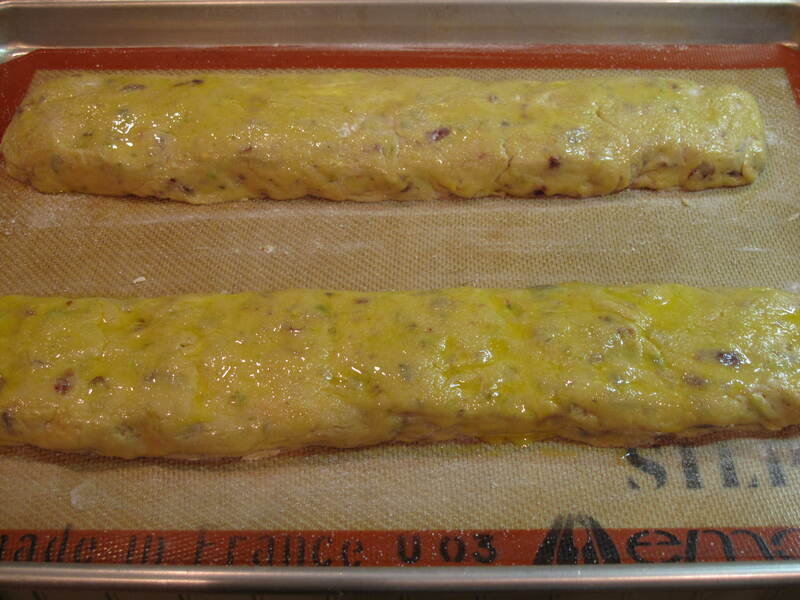 This solution starts by reducing the cooking time written in the recipe by fifteen minutes. When the revised cooking time is complete, you simply turn off the oven and do not open the oven door. Leave the cake in the oven for one more hour so that it continues to cook, but also slowly cools as the oven loses heat. Let me tell you…it worked! So here’s my recipe, modified to use my new non-cracking trick with the oven. Enjoy! Preheat the oven to 375 F. Generously butter and sugar a 9-inch springform pan. In a large bowl, whisk together the ricotta, egg yolks, flour, half the sugar (6 tablespoons) and salt until combined; set aside. 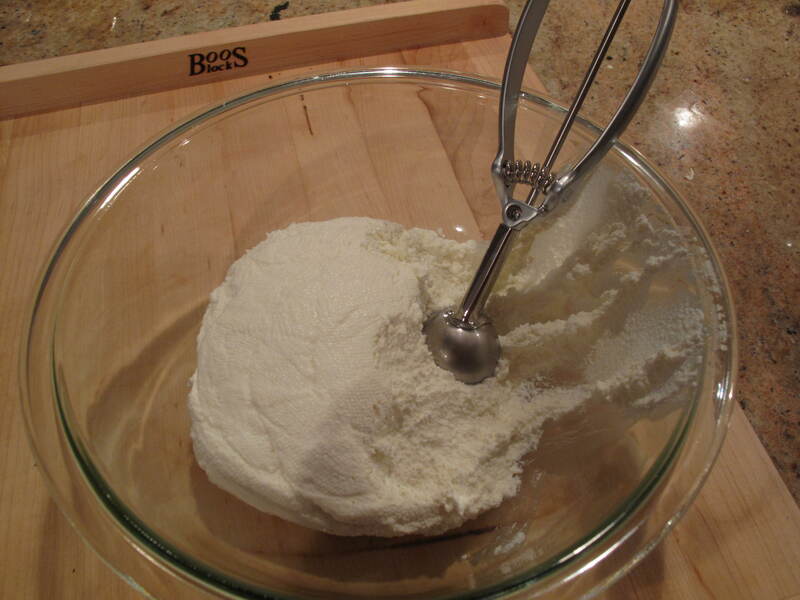 Place the egg whites in the bowl of an electric mixer fitted with the whisk attachment; beat on low-speed until foamy. With the mixer on high-speed, gradually add the remaining 6 tablespoons of sugar, beating until whites are stiff and glossy, 3 to 4 minutes. 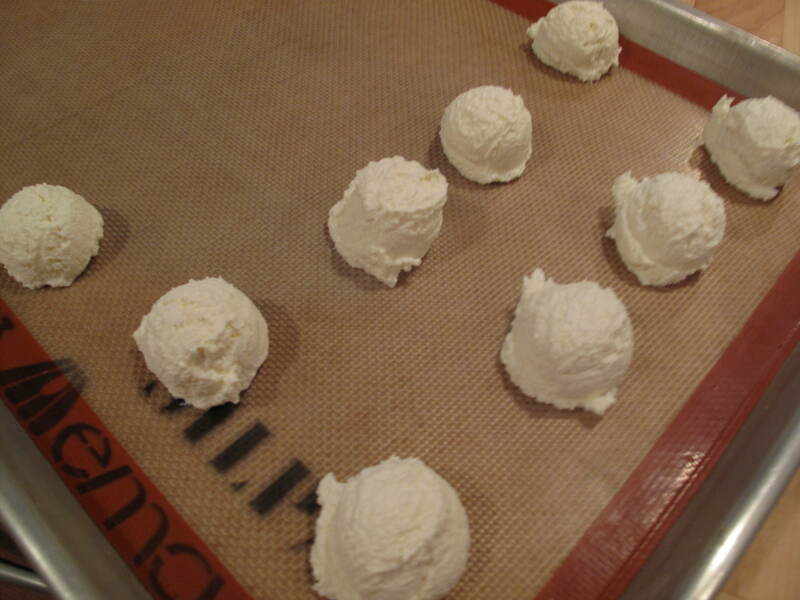 Using a rubber spatula, fold a third of the egg-white mixture into the ricotta mixture until combined. Gently fold in the remaining egg-white mixture until just combined. 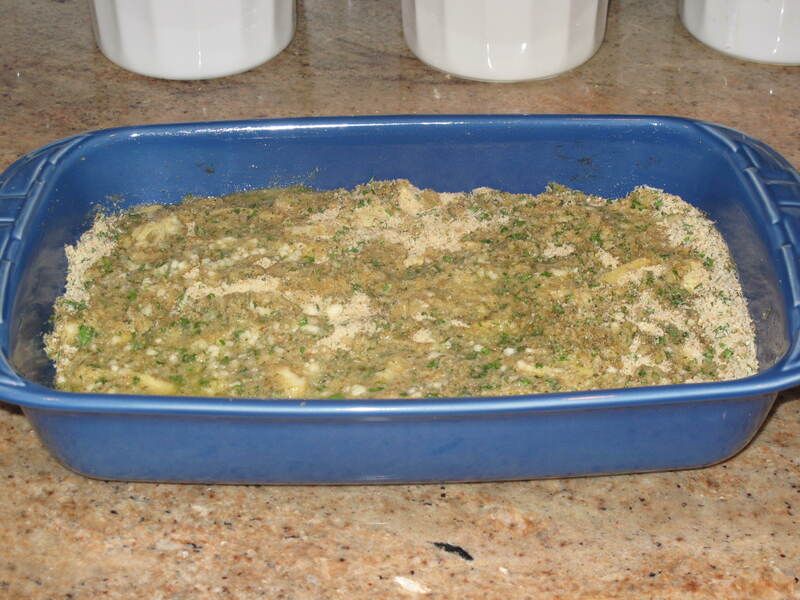 Pour into the prepared pan and bake until the center is firm and the top is a deep golden brown. To avoid cracking, bake 45 minutes and then turn oven off with cheesecake still inside the oven (do not open oven door). Leave cheesecake in the oven another 1 hour to continue cooking and to slowly cool down. Transfer to a wire rack to cool for 10 minutes. 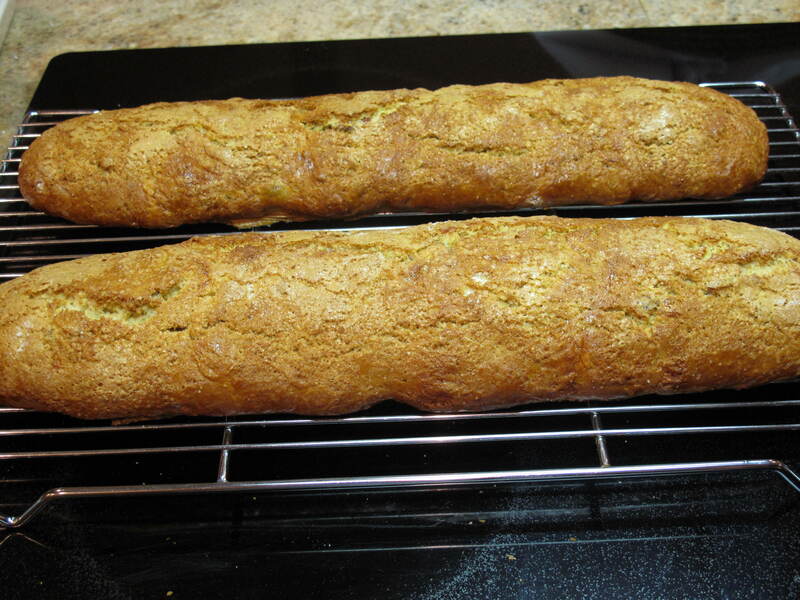 Take a paring knife and run it around edge of cake and the cake pan to avoid sticking. Place another wire rack on top of the pan and invert cake onto the rack to remove from pan. Reinvert cake and cool completely, top side up. 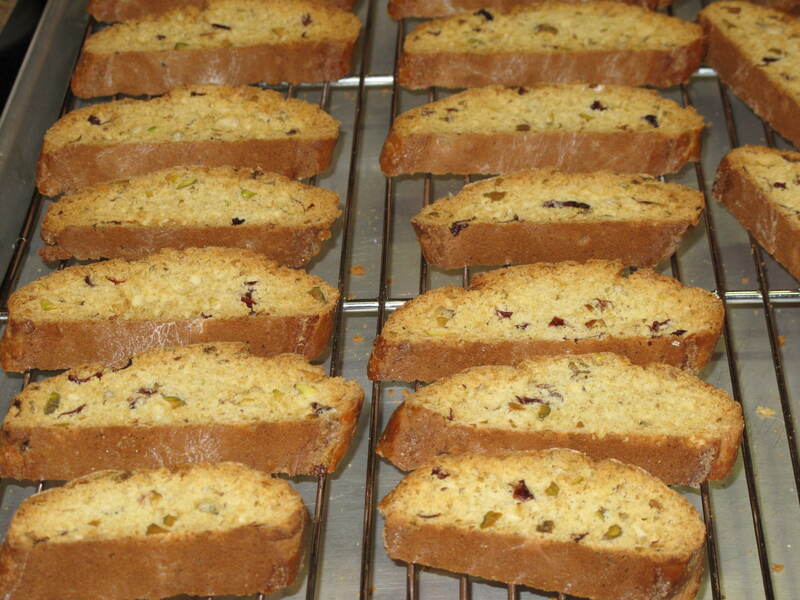 Cake should be eaten the same day it is baked, however, it can be refrigerated for up to 3 days. Bring to room temperature before serving. This is the question-if you decide to fry ricotta cheese, do you make it a savory appetizer or a sweet dessert? That was the decision we had in front of us and so we decided to do both in the same meal. This means we started off our little dinner party with a savory fried ricotta dish and ended the meal with the same fried ricotta made into a sweet dessert. Most people equate fried cheese to the fried mozzarella sticks you get in your typical bar or tavern fare. However, our Italian recipe for fried ricotta, known as ricotta fritta, has a subtle texture and flavor that works better being turned into a first course or dessert than its more famous mozzarella cousin. The creamy texture of the ricotta fritta also cannot be beat. So here is our recipe for ricotta-two ways. Put the drained ricotta in a bowl. With an ice-cream scoop, scoop out tablespoon-sized balls of ricotta, and set them on a parchment-lined tray or sheet pan (you should have about twenty-four ricotta balls total). Set the tray in the freezer, and chill the balls until firm, about 30 minutes. 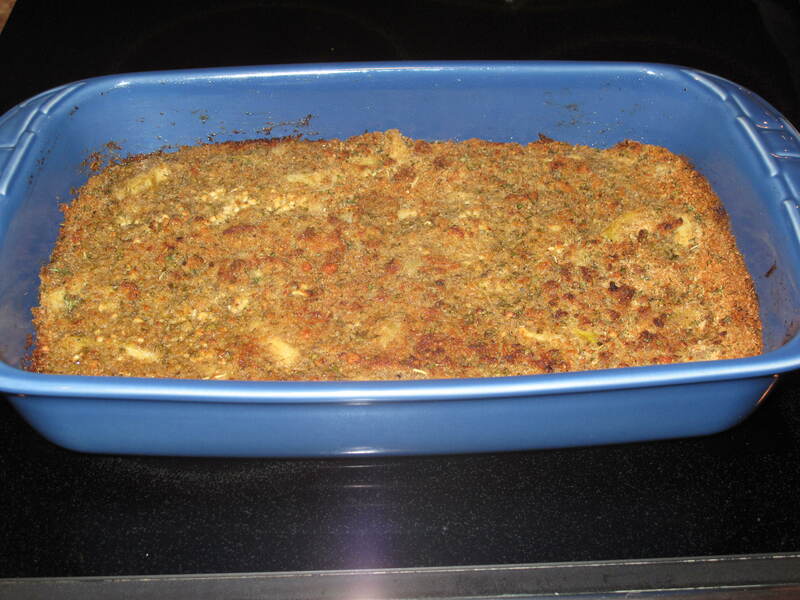 Spread the flour on a small plate and the bread crumbs on a large plate. 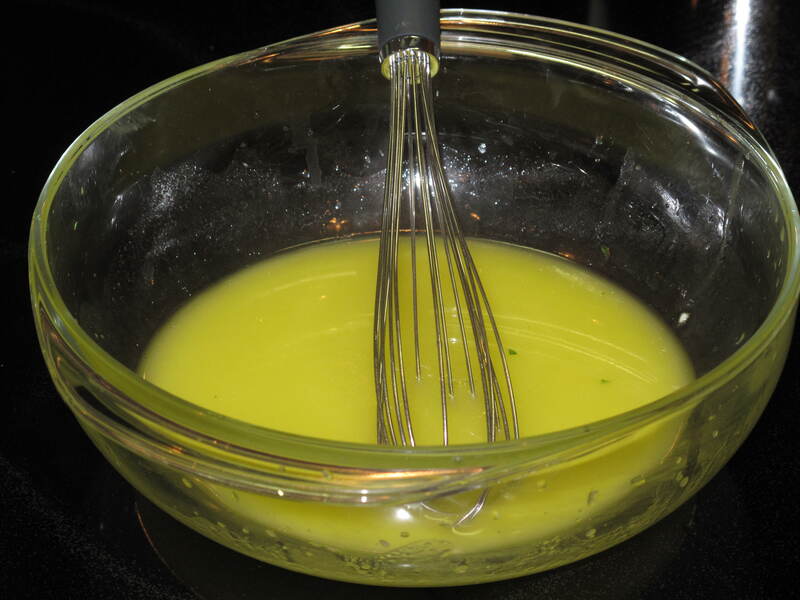 Whisk the eggs with a pinch of salt in a wide, shallow bowl. 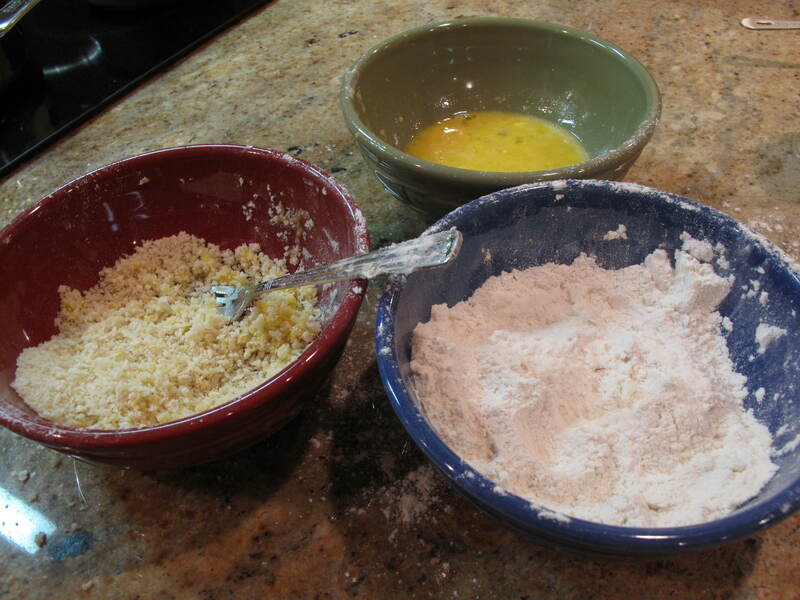 Dredge the balls in the flour and gently flatten them into thick patties. 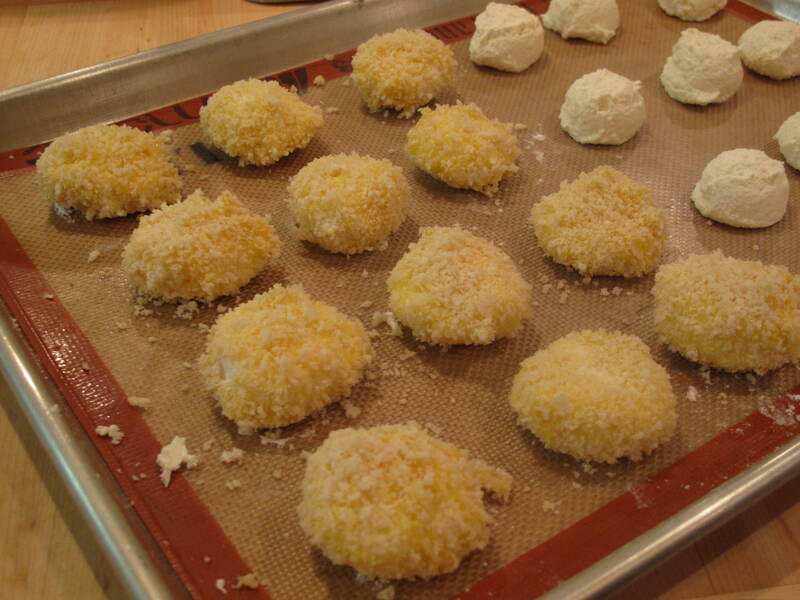 Coat the patties in egg, then dredge them until well coated in the bread crumbs, but not heavily so. Return the breaded patties to the parchment-lined tray. 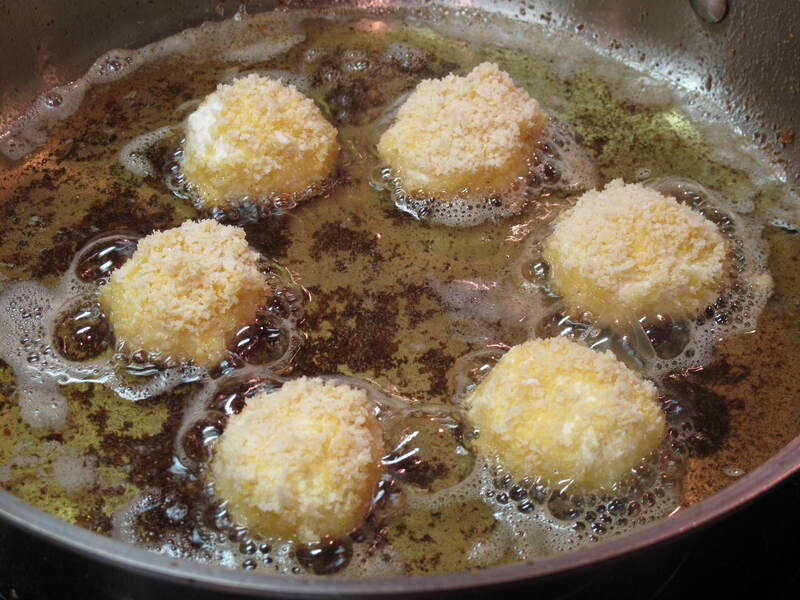 When you are ready to fry the patties, pour the vegetable oil in the skillet and set over medium heat. The oil is ready when the tip of a patty sizzles on contact. Drop the patties into the skillet in batches, so they are not crowded, and fry for 1 to 2 minutes on each side, until golden brown and crispy. Lift them from the skillet with a slotted spatula and drain briefly on paper towels. Serve ricotta fritta while still hot. 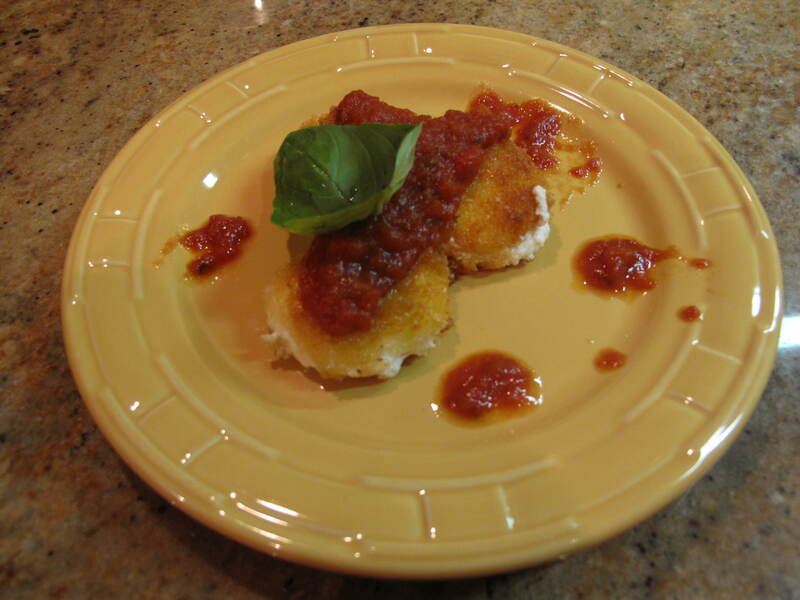 For a savory appetizer or main course: spoon a pool of hot marinara sauce onto each serving plate, set 3 fried patties in the sauce and scatter basil on top. 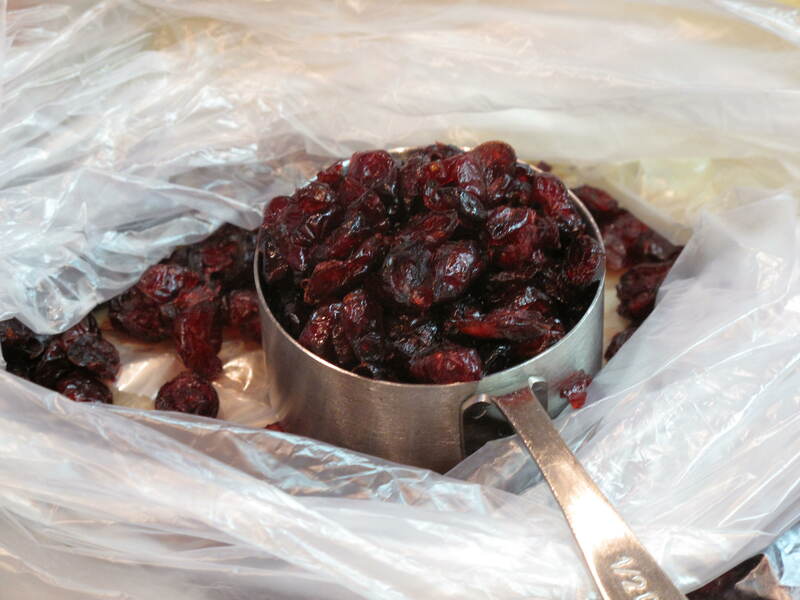 For a dessert dish: top 3 patties with warmed preserves (or any fruit jam or poached fruit) and whipped cream. In our little experiment, we found we liked the sweet version the best which is surprising because most of us at the dinner are not real dessert lovers. 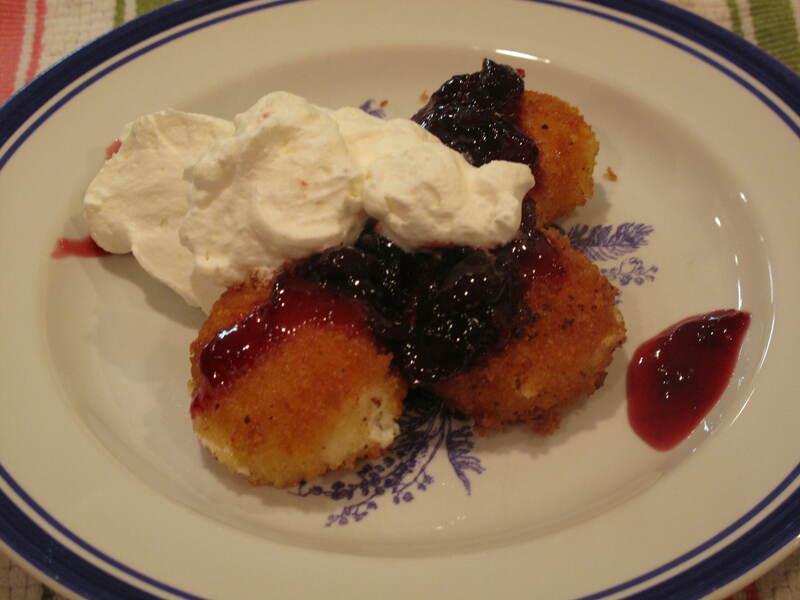 Somehow the sweet taste of the preserves and cream played nicely off the creamy and tangy flavor of the fried ricotta. 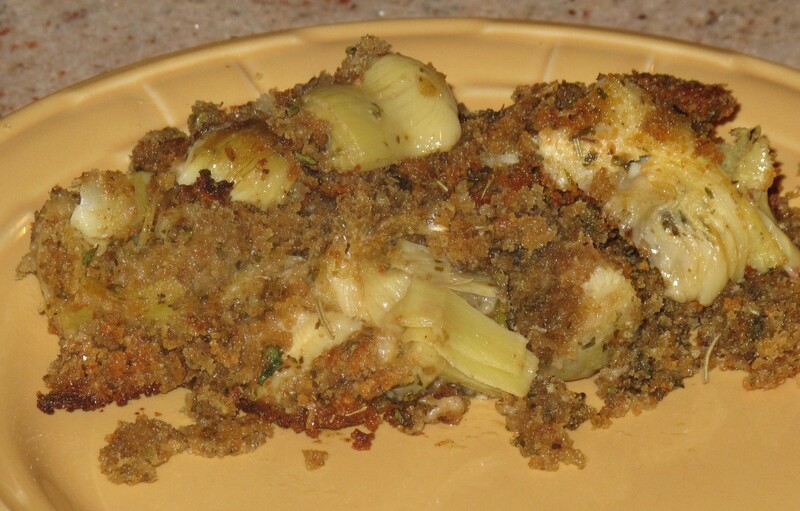 Don’t get us wrong….there wasn’t any of the savory fried ricotta left over, so it must have been a crowd pleaser as well. We’ll definitely be giving this versatile dish another go in our kitchen. We hope you will too. 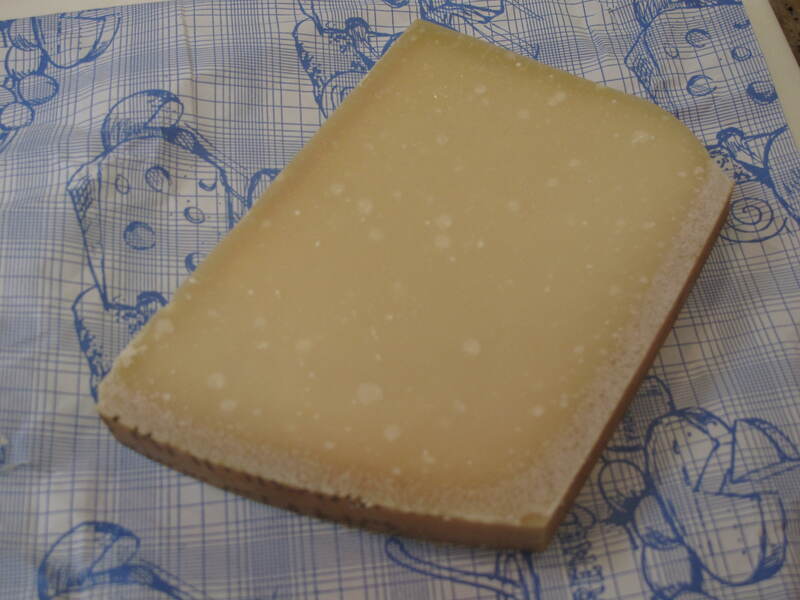 Do you have any cheese recipes that you use for dessert or for an appetizer that you would like to share? 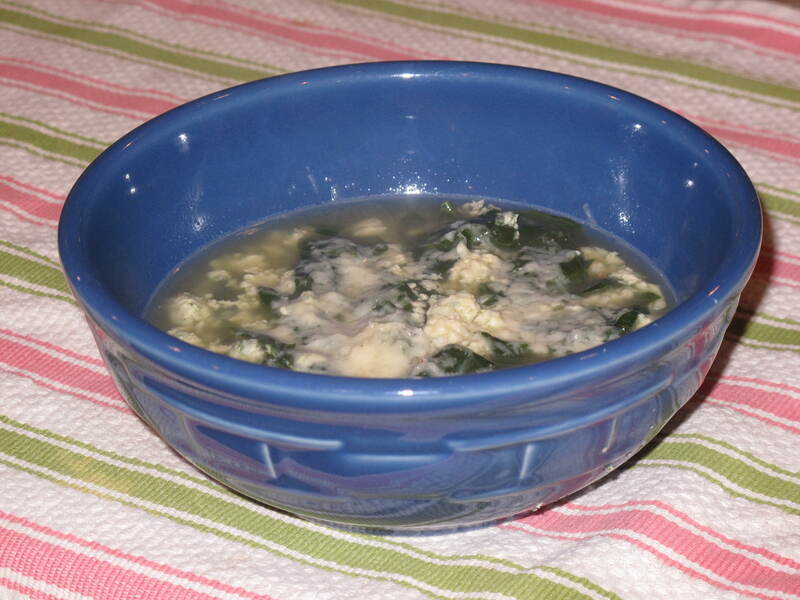 This is a bowl of Italian Stracciatella soup. A friend of ours that is Italian also calls it the “Mom, I’m Sick” soup as this was the way he was given the all important dose of chicken broth when he was sick as a child. We like it because it is quick and easy to make when you feel like a bowl of soup for lunch or dinner. 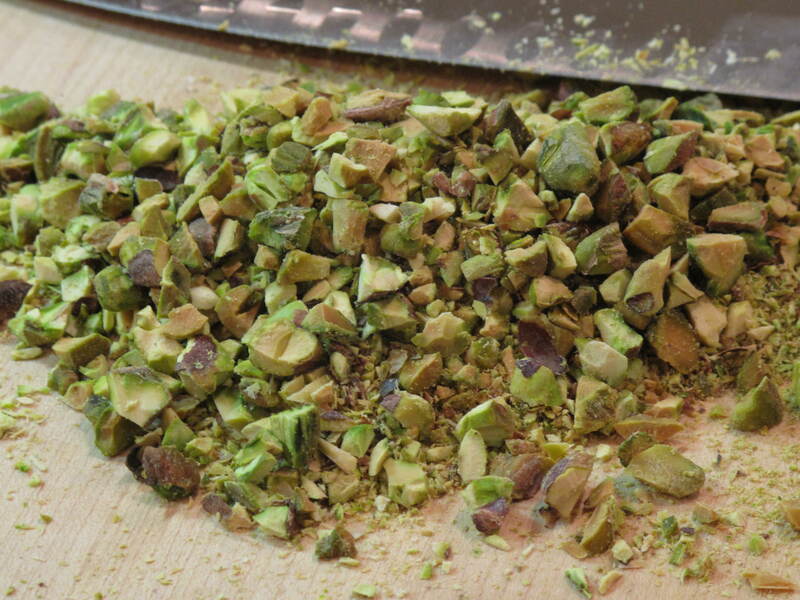 The ingredients are really simple, but the flavor really packs a punch. So when you’re feeling low or just in the mood for some good chicken soup, give this recipe a try. 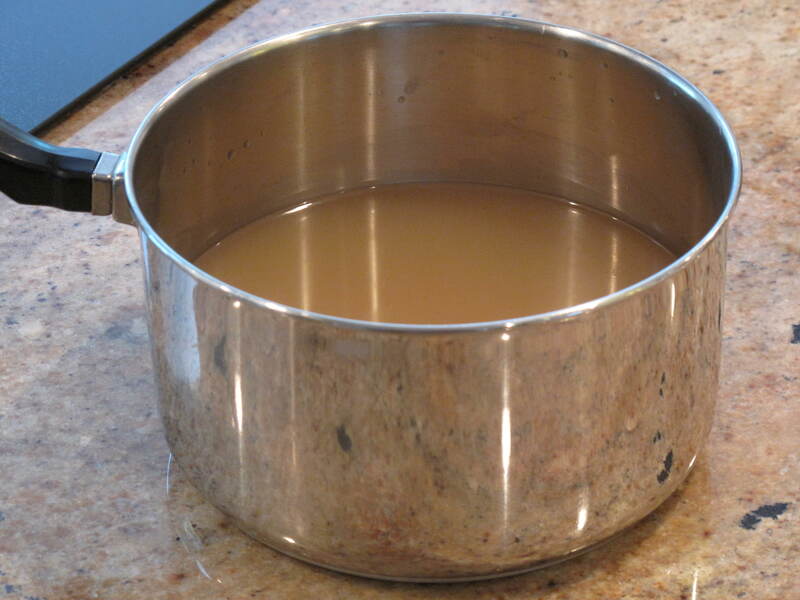 Heat the chicken broth to boiling in a medium-size saucepan. 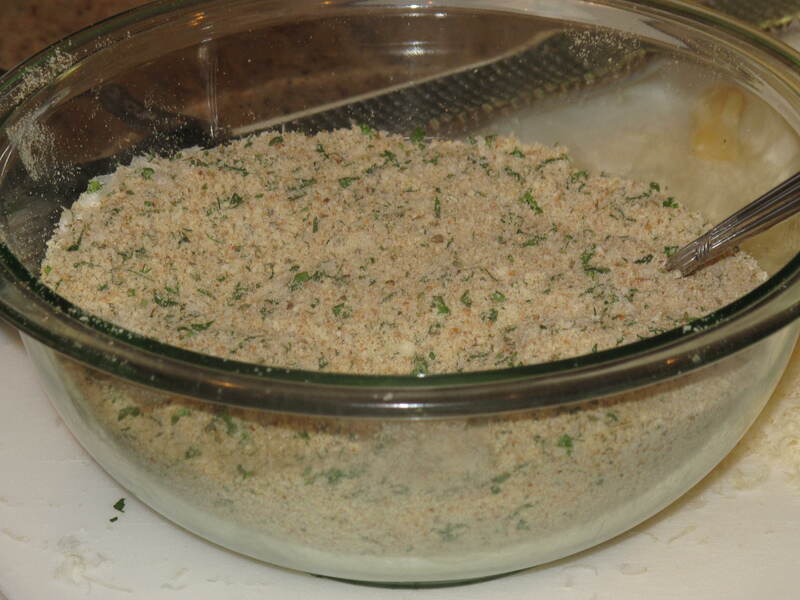 In a small bowl, beat the eggs together and stir in the cheese, parsley, salt and pepper. Slowly, in a steady stream, pour the egg mixture into the boiling broth. Stir slightly. Reduce the heat to medium and let cook for 1 minute. 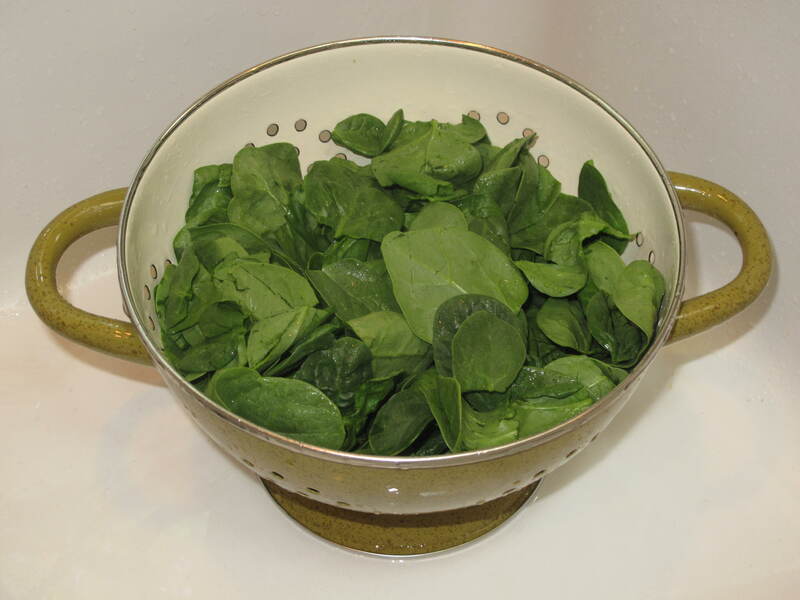 Drop the spinach into the broth to wilt. Stir in the garlic. Serve immediately. Nothing beats home-made chicken soup. Believe this or not, but I’ve read that when you are sick, chicken soup really does help a person eating it get well again. The chicken broth acts as an anti-inflammatory. 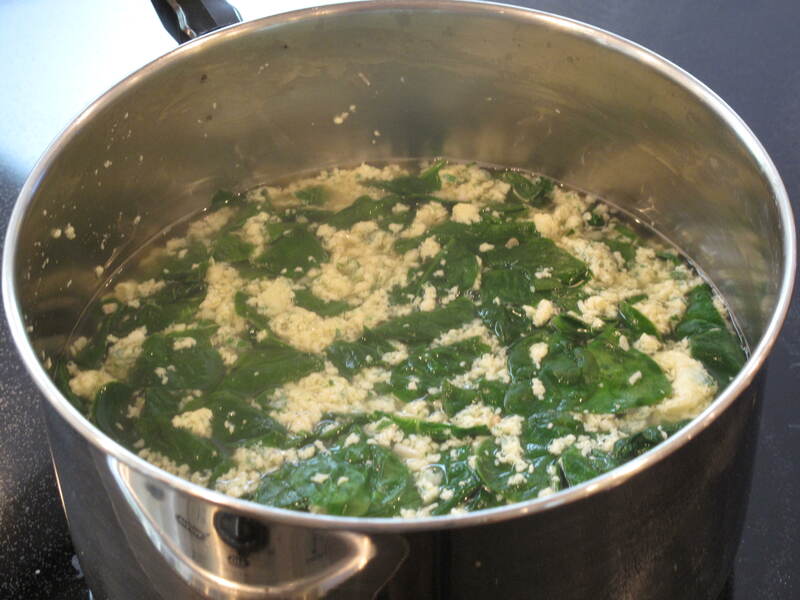 The soup keeps a check on inflammatory white blood cells (neutrophils). Cold symptoms, such as coughs and congestion, are often caused by inflammation produced when neutrophils migrate to the bronchial tubes and accumulate there. 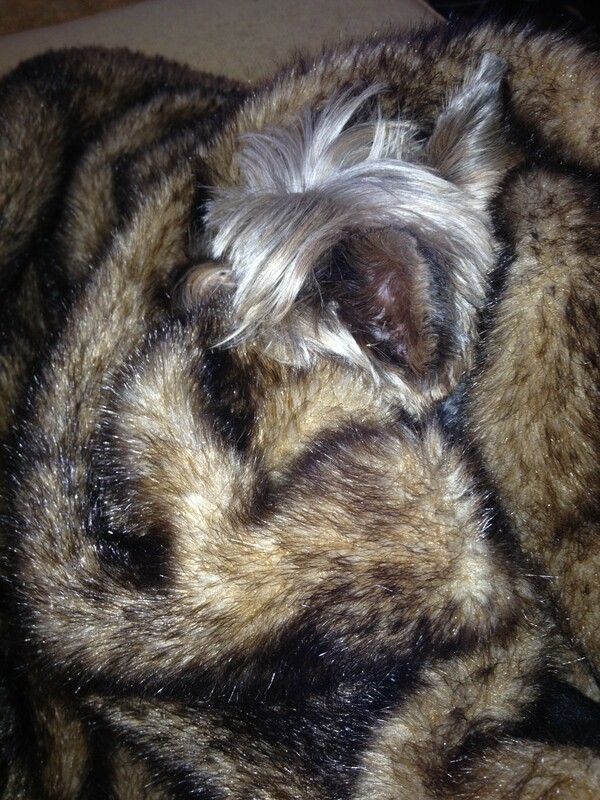 So Grandma did know best!! What do you eat when you are not feeling great? This is a new cluster of heirloom cherry tomatoes growing in our garden. See the morning dew on them? With eight tomato plants in the garden, getting enough tomatoes has not really been a problem this Summer. Better yet, they just keep producing. 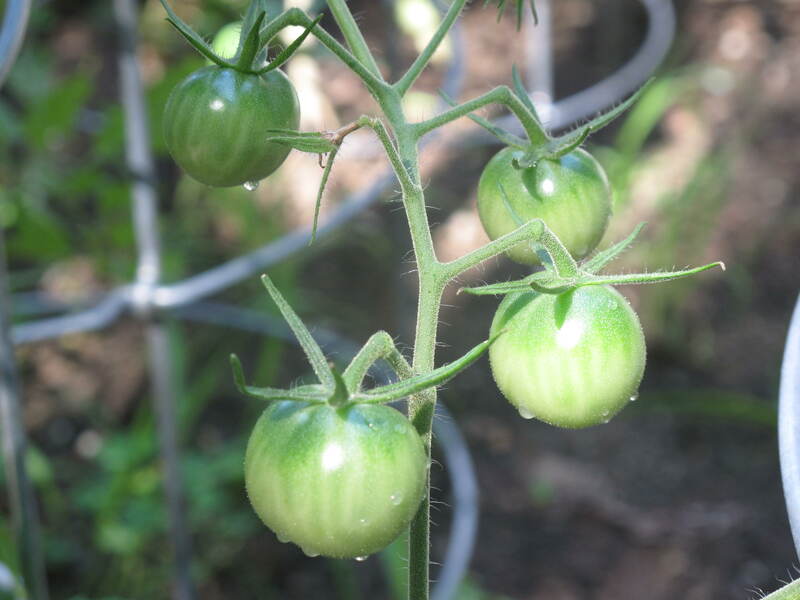 How has your garden been growing this Summer?